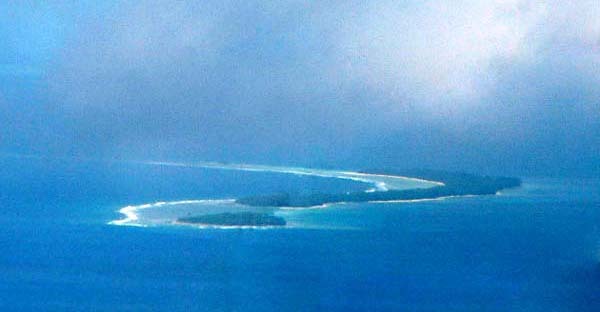 Fedraey Island (the long one), with L'ool'ang in the foreground. Lagoon is to the right. “It was crowded on Fedraey at that time” Alphonso notes. “From the north end all the way down to the southern, even L’odow which is close, was also occupied. At that time we had enough houses in Fedraey, and some of us started building our own houses. When my family reached there, we lived in one Fedraey people’s house for about two months until our own was finished, so we moved into our own house." 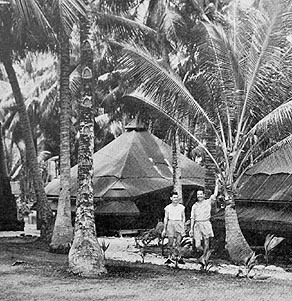 Military tents on Fedraey. Official U.S. Navy photograph, from Wees (1952). While the islanders were concentrated on Fedraey, the other islands were taken over by the military. 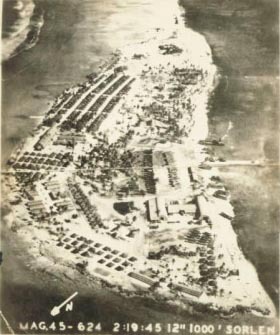 Here, a Marine Air Guard photograph of Sohl'oay shows the intensity of military development. Photograph courtesy of Emmett Baker and Art Bates. “I was there for two years and three months," Manuel says. "A long time. 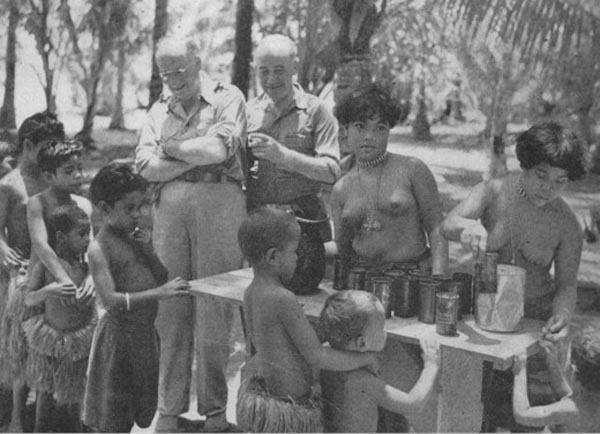 We were lucky that U.S. government gave us U.S. food, because that island has no taro patches, no bananas, no nothing, so we were lucky that U.S. government fed us." "Water, they’d bring down drums of water,” Alphonso says.“They came down and tried to dig wells but the only thing they have is brackish water which is not fit for drinking, so they brought down water." Wednesday Morning Mass on Fedraey. Official U.S. Navy photograph, from Wees (1952). “You would not believe it,” Alphonso elaborates, “but at that time, some type of corned beef that they gave us was about two feet long and about five inch across—a big can. In fact some people couldn’t eat theirs so what they did, they piled them up and made beds—they put their mats on top and slept on them. "And another type of corned beef was about one foot long and about half a foot wide, shaped sort of like a small corned beef that we have now, except that they were much bigger. Those were the kinds of corned beef that they gave us. There were some other canned foods that I don’t see any more, I guess they don’t make them no more." Canoe on Fedraey. Photograph courtesy of Ari Phoutrides. 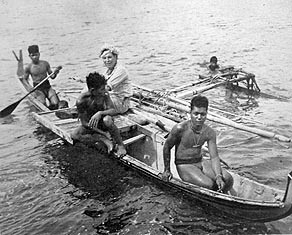 The Navy's Dr. Wees goes turtle-egg gathering with unidentified Ulithians during the time on Fedraey. Official U.S. Navy photograph, from Wees (1952). "When they reach a certain time, these cans expire and they would dump them in the water. But most of them landed up on the beach. You know how long Fedraey is—it’s like a net. And I tell you, all kinds of chicken, turkey all kinds of meat—still frozen—landed up on the beach. We started eating it. We dug a hole in the ground and dropped some of them in there and finally the island began to stink!" “We continued fishing,” Alphonso adds. “On Fedraey, all people would go out together and go net fishing, and come back and distribute the fish among the people there. Most of the time, people got together to go out fishing. Very seldom did individuals go out to fish for themselves at that time." It was called "Murderer's Row." 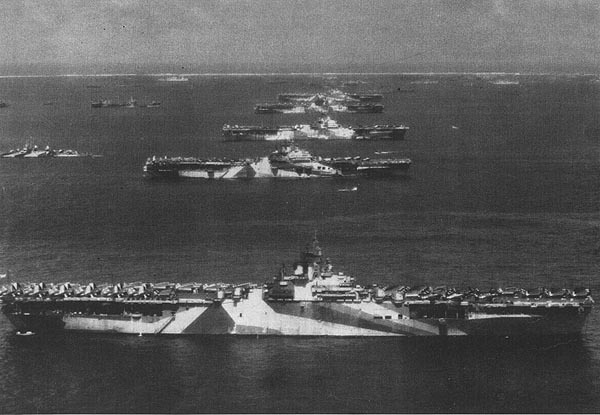 Aircraft carriers lined up across Ulithi Lagoon. 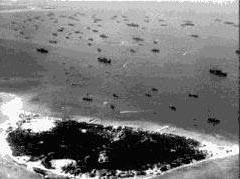 Ulithi was used as the major "secret" naval base during WWII. Official U.S. Navy Photograph. “There were many U.S. solders here on Falalop. Sometime I came from Fedraey to visit this island and I looked around on this island. Now the population at that time was, I think, a thousand U.S. Marines and Navy and Air Force and such. They had a big impact on this place. They built the airport by themselves. Not like the Japanese, using Okinawans and Koreans. Americans, they just used Americans soldiers. 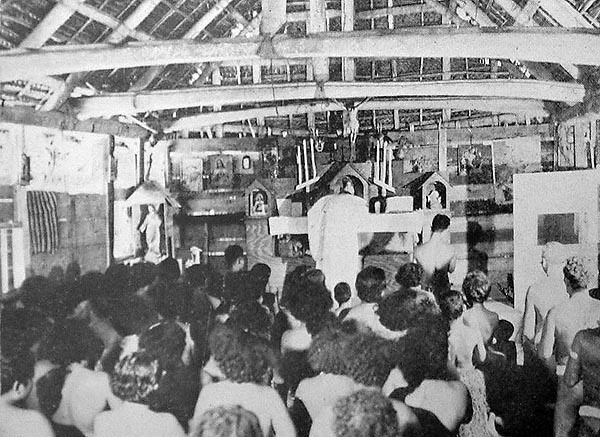 “If you were on Falalop or on Asor," Alphonso says, "you could hardly see Mangeyang, or maybe Mangeyang but not Fedraey. Or the other small islands on the other side, because the lagoon was just full of all kinds of ships, military ships, aircraft carriers, battleships, destroyers, oilers, all kinds." 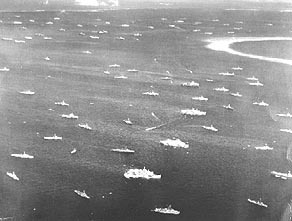 "Concentration of the Fleet, Southern Anchorage - looking north. (NH 91386)." This is believed to be an official US Navy photograph. From Arnold (2003). Mogmog, with part of the fleet. Photograph courtesy of Emmett Baker. "I used to go with my father and some men, we sailed between ships, you look up like that"— Alphonso looks way up. "And usually those ships, they called us when we were close by, and they made us sandwiches and cola and all those things, they handed these down to us. And sometimes beers. “And in fact during that time, if men left Fedraey and went to these small islands to go fish or something, they ended up drunk because beer would just pile up on the beach. We had more fun on those small islands, where there’s a lot of beers all over the place, than on Fedraey." "Elvira and Petra distributing orange juice." From Wees (1952). 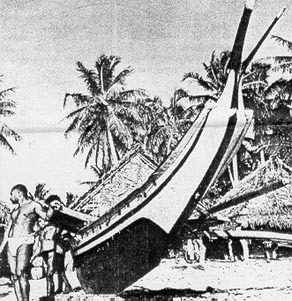 “The atoll was already fortified, occupied. Asor was used for their headquarter, Falalop was for the Air Force, Sohl’oay island was the hospital island, and Mogmog was the recreation island. That’s where they went to drink beer and do all those things. And I guess Ptongeras was where the Coast Guard used to be. “There was an airplane patrolling Fedraey, because it was out of bounds to the military people. If you had no permission, you could not come to the island. During that time, that’s when the Americans were fighting in Okinawa. So those ships that came back to relax, they didn’t know anything about our being out of bounds, so they’d try to come in. "So the Navy assigned another small destroyer to go in front of L’odow and Fedraey, back and forth, back and forth. I think one or two times they had to shoot around those boats that were coming to the land, to make them turn away." “One night we were in school, a night school,” Alphonso recalls, “and some people came and said there were some boats coming in. So we ran down with these Americans—there was a one doctor and one chief who was supposed to be the guard—they got their pistols and ran down. And these guys were coming up. There were some officers in uniform, I think I spotted one of them, a Lieutenant." 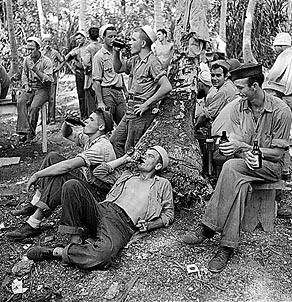 Sailors on Mogmog, enjoying their beer. Photograph from Arnold (2003). 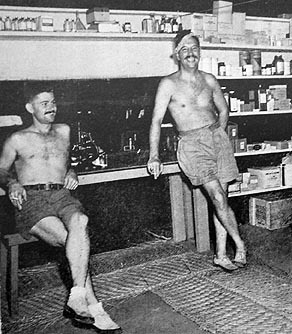 Dr. Marshall Paul Wees (right) and Chief Pharmacists mate Francis Wilson (seated), shown here in their Sick Bay on Fedraey, provided health care during this time. “And the doctor—I think he was either a Lieutenant Commander, or whole Lieutenant—he says, ‘Don’t you people know this place is out of bounds?’ ‘Sorry sir, we just arrived, we just came back from Okinawa and we are learning about….’ ‘Well you can not come in.’ If you want to come in you have to go back to Asor and get permission from there and then come in here.’ So those poor people went back, but there were others who tried to come in." "Life was much, much different,” Manuel notes, “because American people were very kind to us, more than Japanese people, and they treated us differently from the Japanese." When the Navy returned them to their respective islands, they found the islands to be dramatically different. The next page looks at this immediate post-war period.